It is easy to get a taxi in many airports in the Philippines not named NAIA. The list includes, of course, Mactan Cebu International Airport. There is a regular taxi stand just a few meters walk from the arrival area. You have to cross the driveway and there are directional signs to guide travelers towards the taxi stand that is just a short flight of stairs from the corridor across the arrival area. Directional sign to the taxi stand – definitely not international standard but is clear and sufficient for its purpose. Queue for taxis – there has been an improvement here as there is now a tent for passengers’ shelter and a driveway for taxis. It used to be an open area along the MCIA driveway where taxis are lined up. The stand is manned by airport security and staff who also issue information on the taxi on a piece of paper containing a phone number of the MCIA for complaints. I don’t know if they get a lot of complaints and if the airport acts on these if and when there are complaints from passengers. Passengers loading luggage in the trunk of a taxi – there are many LPG-fueled taxis in Cebu and if you have many pieces or large luggage it would be better to select a taxi with more trunk space. LPG taxis have their tanks inside the trunk, limiting space for luggage. Some workers are busy doing the lane markings for the driveway. We thought that these probably being undertaken in preparation for the APEC meetings that several Philippine cities will be hosting. Arriving in Mactan, Cebu for our vacation, I wanted to get a few photos of the airport to have an updated post on the airport. It’s been a while since I had been to Cebu and I noticed my previous posts on the airport did not feature any photos upon arrival. I also wanted to take photos before major work is undertaken for the airport. Mactan Airport is already scheduled for expansion and upgrading under a PPP project with a consortium including local contractor Megawide and the company behind Indira Gandhi Airport in India. (This was the same project where other consortia that included companies behind Changi and Incheon Airports, top airports in the world, lost in the bidding.) Here are a few photos of the arrival area as well as some tips for getting a taxi to your hotel, resort or wherever you’re going from the airport. We got to use the tube as we deplaned (unlike in Manila) and walked towards the baggage claim area. Passengers taking their positions to pick up their luggage from the carousel. Tourist information, hotels and other counters and booths greet arriving passengers at the airport. Passengers waiting for their bags to come out of the carousel. A friendly reminder to people claiming their baggage. The sign is in English, Japanese and Korean, indicative of the languages used by most travelers to and from Cebu. Similar to other airports in the Philippines, no one actually checks whether the baggage tags match the claim stubs with the passengers. Fortunately, people are honest and there have been none or minimal incidents of mistaken luggage. To get to the taxi stand, you have to cross the driveway as you get out of the arrival area. There are signs to guide you to the taxi stand where airport security provides assistance to passengers as they board the taxis. I took this photo in a hurry so its blurry. The taxis stand is to the right and up a short flight of stairs. 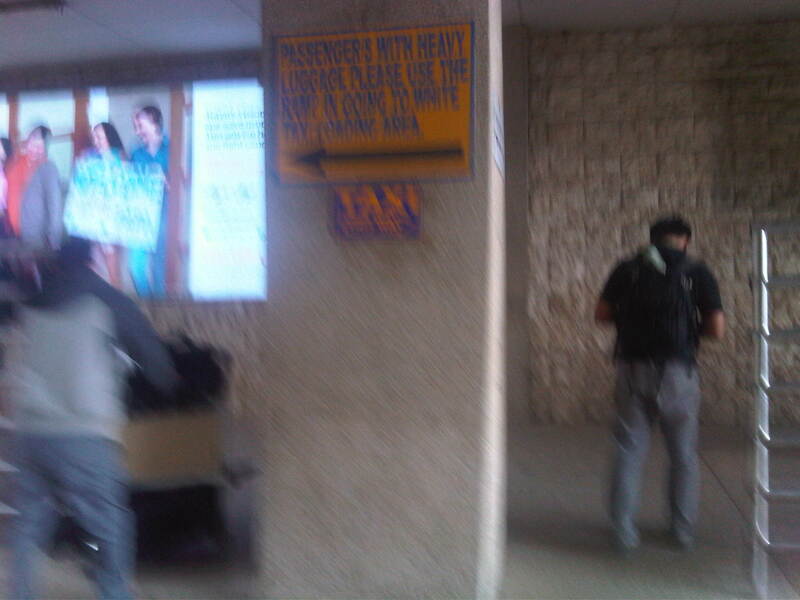 The arrow on the large sign in the photo show the way to a ramp to the taxi stand for travelers with heavy or a lot of luggage. In the next posts: Getting a taxi at Mactan Airport and Mactan Airport departure. 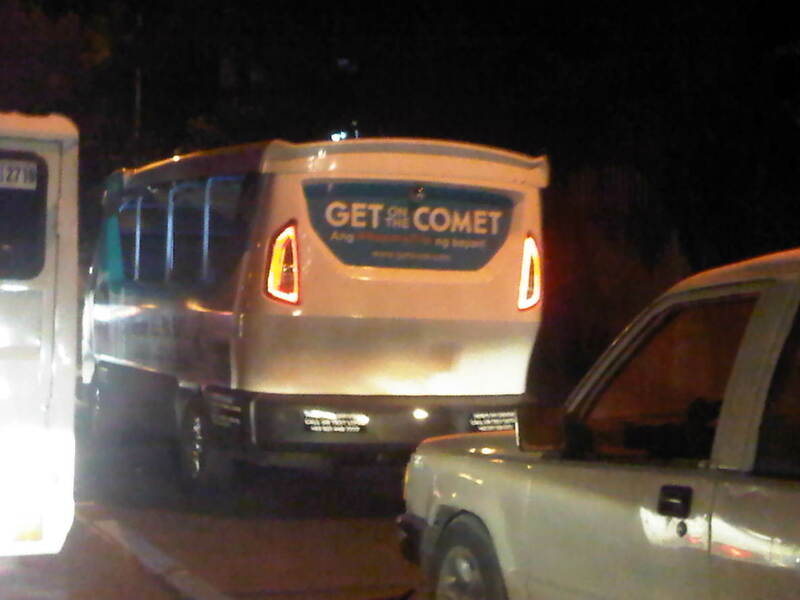 A colleague was saying that he has not seen the Comet, a jitney-type vehicle currently plying the SM North – Katipunan route via Mindanao Avenue and Commonwealth Avenue, for quite some time. I shared the same observation and this is based on my regular commute that includes travel along Katipunan Avenue. The Comet is becoming, if it is not yet, a rare sighting even considering its relatively long and apparently convenient route. The route passes through residential and commercial areas and would be a direct, single ride for students in particular of three major schools in the Katipunan area – UP, Ateneo and Miriam. It also connects to 2 large malls, SM North and Trinoma, and 2 rail stations, LRT 2 Katipunan Sta. and MRT 3 North EDSA Sta. Despite these traffic generators along its route, it seems that the Comet still has less than the desired ridership. I say ‘seems’ because I currently don’t have the hard statistics on ridership but only observations from those who have seen the vehicle along its route. I saw this one on my way home last December in heavy traffic as our jeepney approached the Katipunan – C.P. Garcia intersection. It had few passengers considering its long route from SM North EDSA to Aurora Boulevard via Katipunan Ave.
What is the future for the Comet? It is unclear so far despite the hype and claims that this is supposed to be the vehicle to replace the conventional jeepney. (To be fair, this is what was also said of the e-jeepney that precluded the Comet.) The DOTC does not have a clear and firm policy or commitment to making this work. Its pronouncements have so far been towards deploying the Comet along new routes instead of replacing existing jeepneys on existing routes with this low emission vehicle. I believe that the only way for the Comet to work is for it to be mainstreamed as a replacement for the jeepney and along suitable routes, of course. The DOTC could and should review jeepney franchises to determine how the Comet and other similar low emission vehicles can be phased in over a realistic period in order to modernize public transportation currently being supplied by conventional jeepneys. I recently noticed that there are jeepneys along Katipunan bearing tarps on their sides stating “No to additional jeepneys.” Underneath are the names of three jeepney groups supporting this call but with the exception of a major jeepney group that’s supposed to be supportive (even owning several units) of the Comet. Are the signs a form of resistance to change? Do the groups know or understand what they are saying and what they stand for? Or are these indicative of disagreements among jeepney groups, operators and drivers regarding the future of their operations using conventional jeepneys? There will surely be resistance from these sectors if there are changes to be made that will affect their sources of income. It is a very daunting and sensitive task to decouple transport and livelihood in the Philippines. However, the issues coming out of such changes to improve public transport services should be met head on rather than skirt them, particularly in the case of the agencies responsible for these services – the DOTC and the LTFRB. Only then can we have the transformation we need for road-based public transport in this country. Many have been asking about the overnight parking rates at the Ninoy Aquino International Airport (NAIA) Terminal 3 and I had wanted to write on this but just didn’t have the material to share with readers of this blog. I had wanted to verify for myself the overnight parking rates at Terminal 3 but had not used the Terminal for my flights last year, which had me using all except Terminal 3 for my travels. Last weekend, I finally had the chance to check the parking rates as I left my vehicle at the airport for a weekend getaway before school (and work) starts for the second semester at the university. 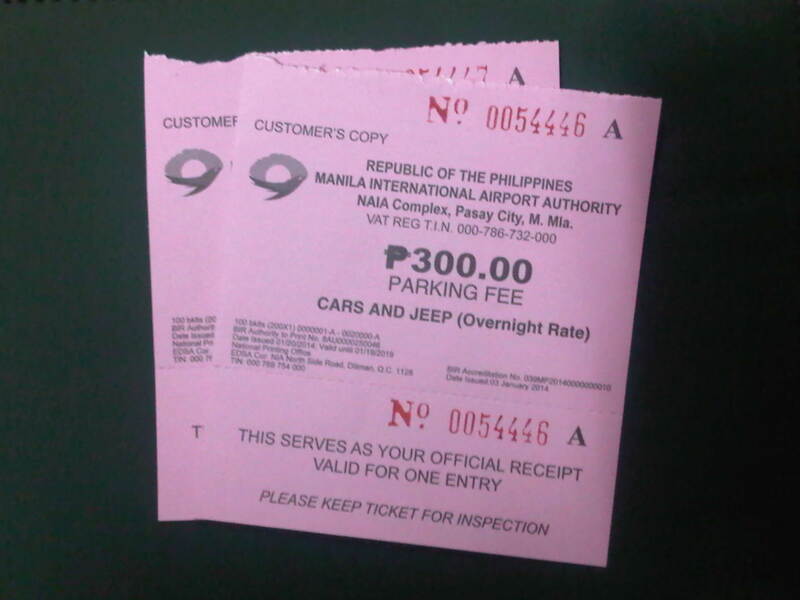 Parking tickets issued at NAIA Terminal 3’s multi-level facility. The parking fee is 300 pesos per night. This is a fixed rate and you don’t have to pay additional fees for when you exceeded the hour when you parked your vehicle. That is, even if you parked your vehicle at 7:00 AM the previous day and took it out at 5:00 PM the following day, you still get charged 300 pesos and NOT 300 pesos plus a charge for exceeding 24 hours parking. For those parking at the multi-level facility, one just has to drive through the arrival level (ground) of NAIA T3 and turn right near the end of the driveway to enter the facility. I haven’t checked if the access at the departure level is open (perhaps a reader can verify this?) but they do have security checks between the parking facility and the terminal itself so people can go directly to the parking area without dropping off their companions and luggage at the terminal. You don’t have to drop-off your companions and luggage at the departure level and then go around the airport road again just so you can park your vehicle at the multi-level facility. 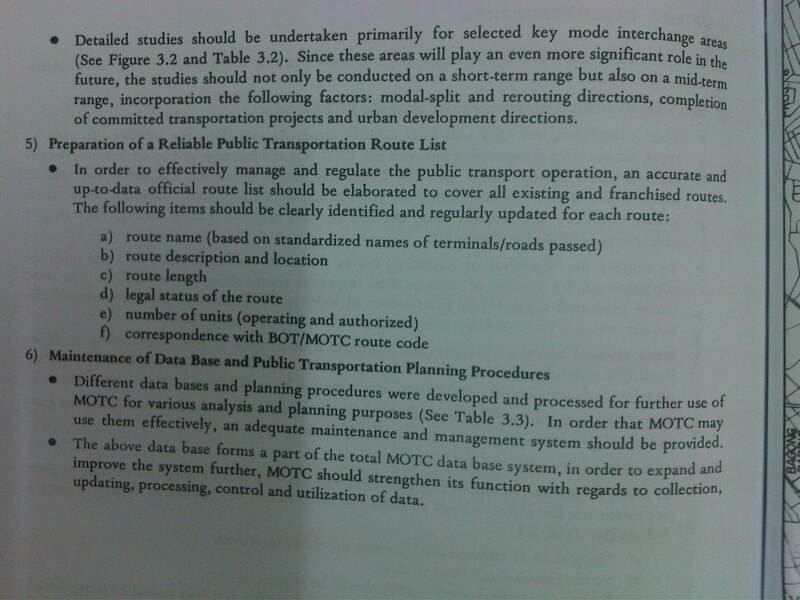 Similar to the previous JUMSUT Phase I, the recommendations of Phase II focused on route structure planning and improvement for road public transport to avoid unnecessary competition between LRT, bus and jeepney. Recommendations for route structure planning included the modification of route schemes for the central eastern sector of Metro Manila mainly to alleviate traffic congestion and improve schedules. The study reiterated the recommendations of Phase I.
I continue with the series of posts I had started last year on past studies conducted for Metro Manila. It is important to review these studies in order for us to understand how transport in the metropolis came to be how it is now. I believe there are many lessons to be learned and history does not need to repeat itself (although as we can see, it has in as far as transport in Metro Manila is concerned). 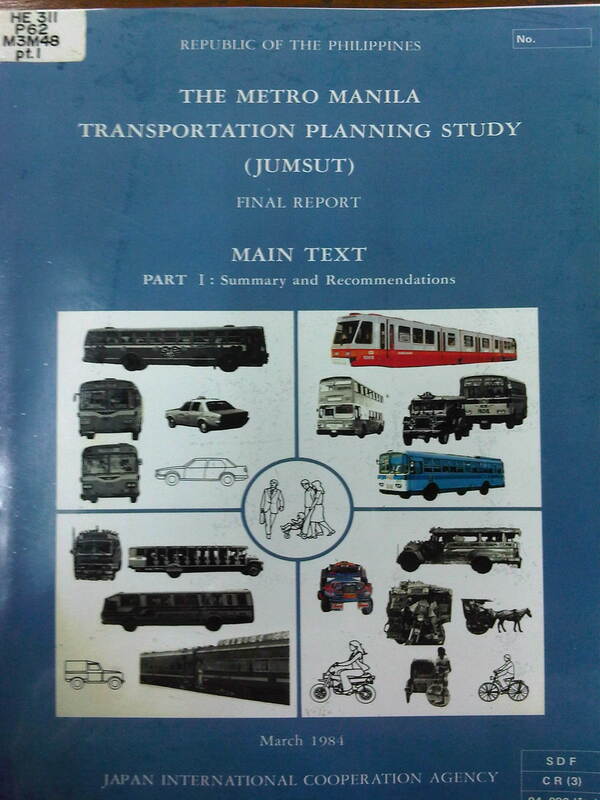 The Metro Manila Transportation Planning Study better known as the JICA Update on Manila Study on Urban Transport (JUMSUT) was conducted in two phases, the first one from November 1982 – March 1984 and the second from June 1984 – March 1985, respectively, as a follow-up to MMUTSTRAP. 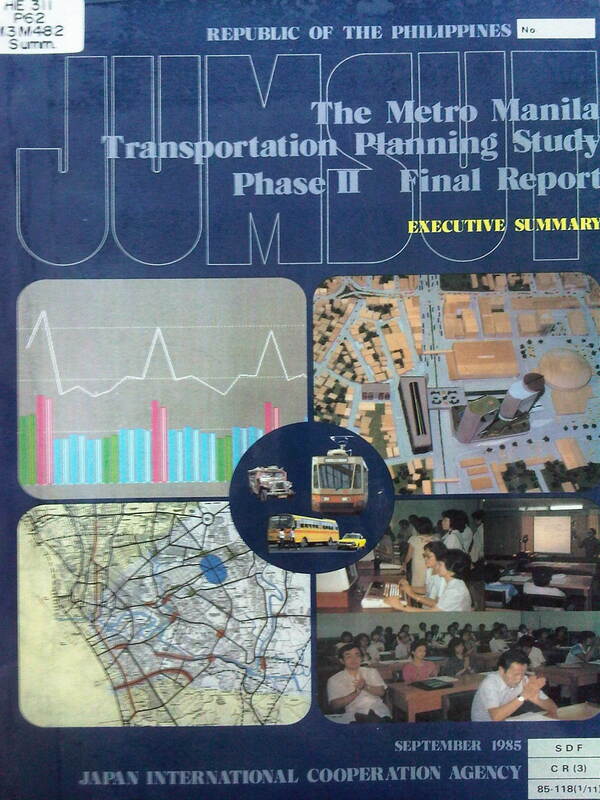 JUMSUT focused on studies to support the implementation of the LRT Line 1 project along Rizal and Taft Avenues. 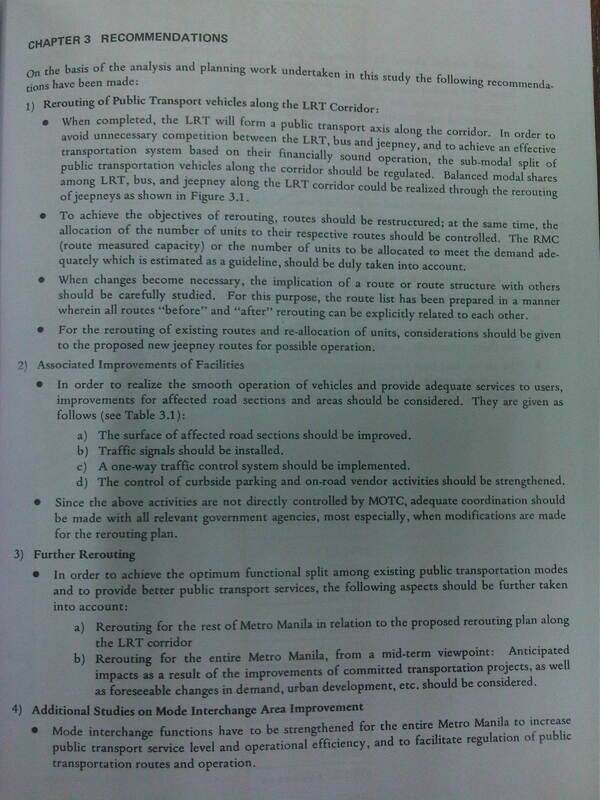 Recommendations of the first phase are mostly on the rerouting of public transport vehicles along LRT corridor and the traffic management required for the construction and eventual operation of the LRT Line 1. 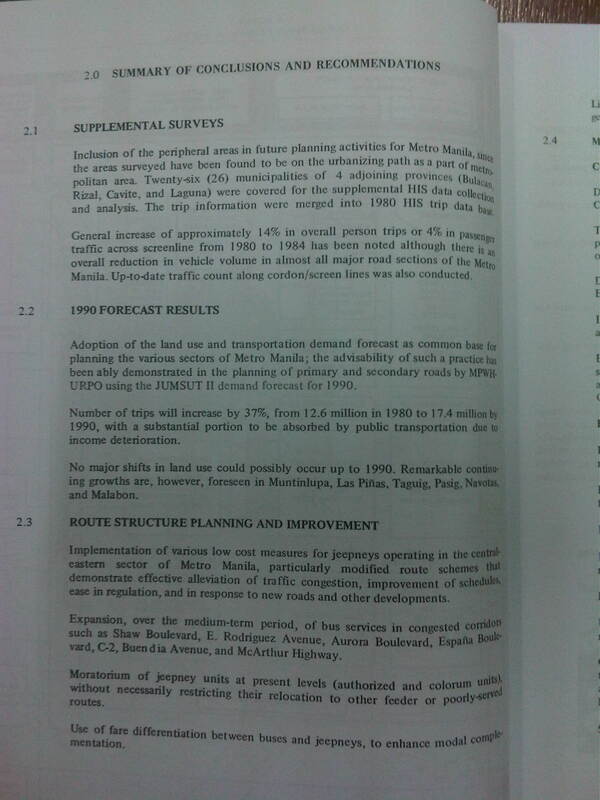 The rerouting is presented as a necessity to avoid unnecessary competition between LRT, bus and jeepney as well as to achieve balanced mode share among LRT, bus and jeepney along the corridor. Following are photos showing a summary of recommendations for JUMSUT I. A lot has been written about the new license plates being issued by the Land Transportation Office (LTO) for vehicles. I have read and heard many opinions or explanations from officials, experts and pundits about how the current license plates were better than the old ones due to its security features. As well, I have heard the opposite – criticisms by similar officials, experts and pundits usually focusing on the flaws of the new plates compared to the previous ones. They do agree on one thing, that the 4 numbers now appearing on the new vehicle plates issued to vehicles registered from January 2014 (5 numbers for the new motorcycles) are a necessity due in part to the rapidly increasing number of registered vehicles in the Philippines. Of course, the delays in the actual issuance of the plates themselves for new vehicles is another story. Green plates are for private vehicles (not for hire). Red plates are for government vehicles. Blue plates (with only numbers and no letters) are diplomatic plates. Orange plates are the newest type of plates and were issued to electric vehicles. These solid orange plates and not of similar design to those bearing the Rizal Monument. Yellow plates are for “for hire” vehicles including public utility vehicles like buses, jeepneys, taxis and vans-for-hire. Recently, there were actually two types of yellow plates. One type used the design with the Rizal monument in the middle and these were issued to limousines such as those operated by hotels and tour companies. The other is the solid yellow plates (no Rizal Monument) that were issued to PUVs. UV Express vehicle with the solid yellow plate. The new plates issued by the LTO are black and white – basically black lettering on white plates. Recently, friends have been telling me about their seeing the new black and white plates on taxis. I had thought that this shouldn’t be the case since PUVs like taxis are supposed to have distinctive color (yellow) plates in order for illegally (so-called colorum) operating vehicles to be spotted easily by authorities. It turned out that the LTO under the previous head of the agency did away with the yellow plates in favor of what they claimed to be more sophisticated new plates. My reaction was that this was absurd and visual identification (i.e., seeing the color of the vehicle’s plate) is still the easiest was to spot colorum vehicles. I had wondered, too, how the LTO came up with that obviously flawed decision and if they consulted among law enforcement agencies like the PNP who would be tasked to apprehend illegally operating road transport. Such incidence of green plates on public utility vehicles were a no-no (illegal) in previous administrations. I assume that this one is “temporary” in the absence of what were phased out yellow plates. Fortunately, the LTO led by its current chief has decided to bring back the yellow plates. These will probably follow the new plate design but with yellow instead of a white background. Hopefully, all legitimate PUVs will have these yellow plates instead of the “temporary” private plates many have been issued. 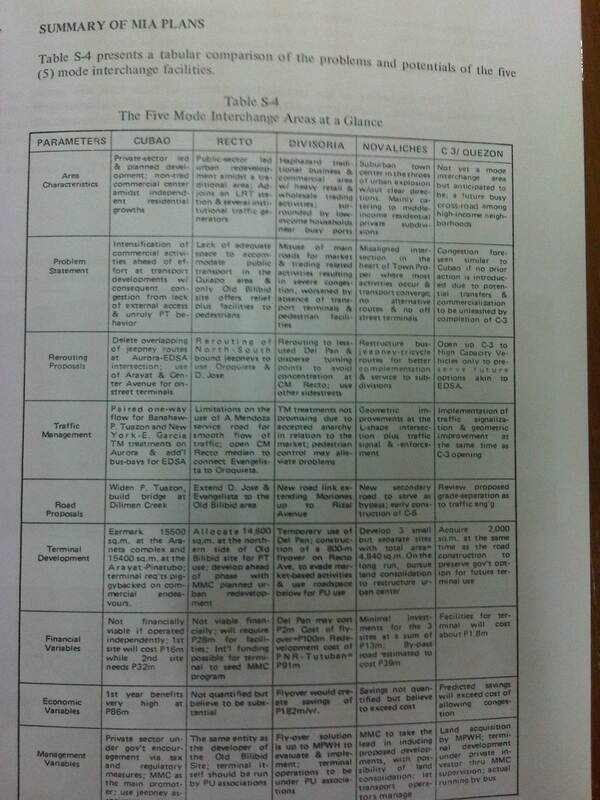 These will aid in the enforcement of regulations pertaining to PUVs and will help weed out colorum vehicles.